Samuel GRAVES II (1628 – 1681) was Alex’s 10th Great Grandfather, one of 2,048 in this generation of the Shaw line. Samuel Graves was born 1628 in England. His parents were Samuel GRAVES I and [__?__]. He was brought to America by his father in 1630. He married Grace BEAMSLEY about 1657. He lived in Ipswich, Mass. from 1651 or earlier until his death in 1681. Grace Beamsley was born 10 Sep 1635 in Boston, Mass. She was baptized 20 Sep 1635 in the First Church of Boston. Her parents were William BEAMSLEYand Ann [__?__]. Grace died 26 Nov 1730 aged 95. Samuel was a hat weaver and felt maker. In the early days hat makers used Mercury in the manufacturer from which constant handling would make one very ill or lead to death. Did his profession affect his health and did Samuel become “Mad as a hatter?” as the saying goes. 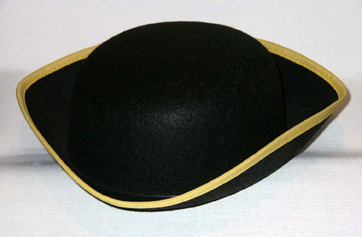 Classic Colonial Felt Tricorn Hat like one Samuel Graves might have made. 5 May 1664 – Records and Files of the Quarterly Courts of Essex County, Massachusetts, Vol. III Court held at Ipswich by adjournment. Richard Smith, complaining against Zachry Debell and William Newman for stealing his canoe, the court ordered that they pay treble damages, £4 19s. Samuell Graves, for suspicion of concealing the prisoner and carelessness in his trust in searching for him, was bound in £50 to appear at the next Ipswich court. Ordered that Mr. Symonds and Major Genll. Denison take order about the security for the good behavior of the prisoners and the charges. Sam. Graves engaged to pay Zacherye’s fine. John’s wife Martha Kneeland was born 10 Jan 1675 in Ipswich Mass. Her parents were Edward Kneeland and Martha Fowler. After John died, Martha married on 6 Dec. 1705 at Ipswich to Jonathan McIntire (Mackentire) of Reading, Mass (b. 1677 – d. 1738 in Reading, Middlesex, Mass). Martha died in 1770. John Graves was a cordwainer [a shoemaker/cobbler who makes fine soft leather shoes and other luxury footwear articles]. When he died, his widow, Martha Kneeland, daughter of Edward Kneeland of Ipswich, was appointed Administratrix of his estate on 21 July 1699. She was appointed guardian of the children on 4 Sept. 1699. Elizabeth’s husband John Choate was born 15 Jun 1661 in Ipswich, Essex, Mass. His parents were John Choate and Anne Carramas. After Elizabeth died, he married 19 May 1690 in Ipswich, Essex, Mass to Elizabeth Giddings (b. 1666 – d. 1723 in Ipswich). John died 17 Jul 1733 in Ipswich, Essex, Mass. Hannah’s husband Christopher Pottle was born 1663 in Devon, England. Christopher died in 8 Feb 1709 – Hampton Falls, Rockingham, New Hampshire. Mary’s husband William Thompson was born about 1674 in Essex, Mass. His parents were Alexander Thompson and Deliverance Haggett. This entry was posted in 12th Generation, 90+, Immigrant - England, Line - Shaw and tagged Ipswich. Bookmark the permalink.